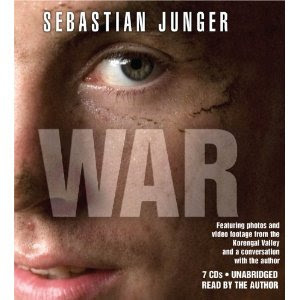 I read the book "War" by Sebastian Junger. He's a war journalist and author of the bestselling book "The Perfect Storm." I liked this book, and strongly recommend it to anyone wanting to learn more about what our troops experience in Afganistan. It's a blunt description of life for the US Army soldiers fighting in the Korangal valley of Afganistan. Junger was embedded with one platoon off-and-on for about a year. Junger was accompanied on his trips to Afganistan by filmmaker Tim Hetherington. Together, they used their footage to produce a movie about this platoon. The film is titled Restrepo and won the Grand Jury Prize at the 2010 Sundance Film Festival. 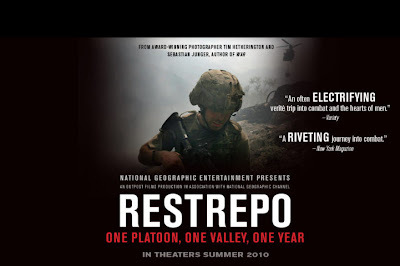 Here's a link to the trailer for Restrepo on Apple's trailer site. Restrepo was one of the forward outposts in the valley. They experienced "contact" (were shot at) almost every day. It was an extremely dangerous place. Here's a slideshow from Time magazine about the Korangal valley - nicknamed the Valley of Death. Junger was there on assignment for Vanity Fair magazine, and they posted some of his articles here and here. Those articles have more photos with links to video and slideshows. Earlier this year, the US retreated from the valley (Washington Post). Probably a good idea. "The Wave" in northern Arizona. I took this in September 2005. Comments do not appear immediately. They are moderated to stop the spam and trolls. Born in the year of the rat. Books I like: Uranium, The Checklist Manifesto, American Sniper, Talent is Overrated, Spy the Lie.